Vibrant energy releasing an orchard in a glass! Fresh and crisp green apple bursts with shades of berry and orchard fruit as earthy dry herbs subtly add a dry bitterness that is amplified by the surge of dry wood that delivers dark chocolate and notes of vanilla. Never too bitter or too sweet, the oak delivers sparks of spice that eventually sparkle in the fog of dry smoky wood that radiates on the palate with shimmers of fruit and the distinct flavour of biting a freshly unpacked cigar! I used a number of whiskies as a benchmark when tasting this whisky, and I tasted it alongside the Highland Park 25 Year Old to determine its score after pairing it with a few other whiskies. 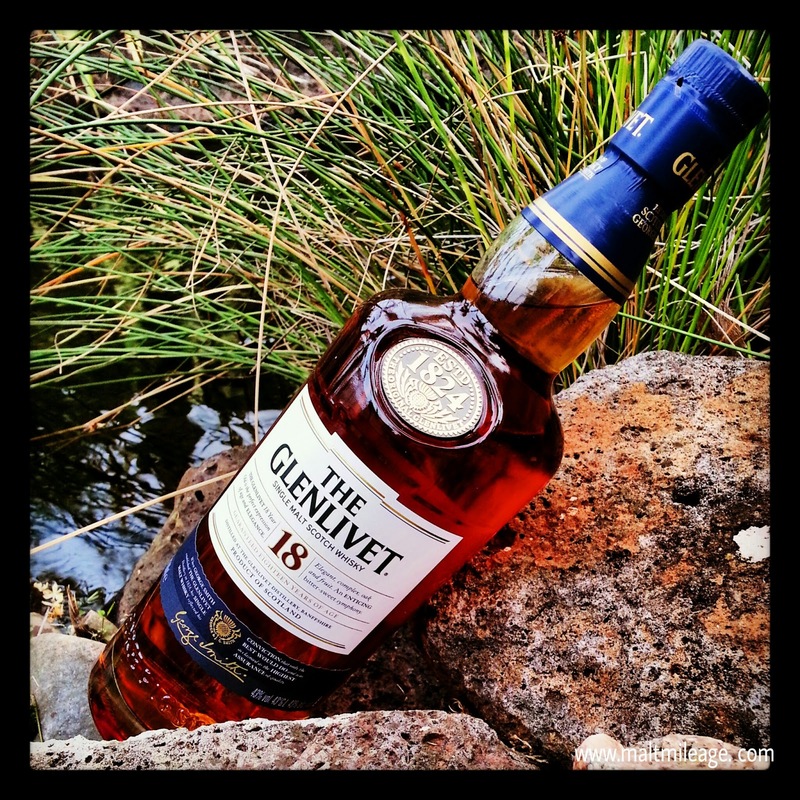 The Glenlivet 18 Year Old does have a distinct dry oak theme with fiery spice, but this is balanced beautifully by the influence of the sherry casks that have imparted a fruity sweetness and tartness to counteract the oak. The result is a silky smooth whisky with a distinctly dry oak finish that is not bitter but herbaceous, earthy and spicy (dry herbs, tobacco, cigar, dry wood, ginger, nutmeg etc). A sharp rich honey sparkles in the backdrop of unripened berries and bursts of fresh green apple and cinnamon add some energy to the gusts of freshness in the glass. Then, in the blink of an eye the fruit ripens, with subtle shades of fructose sweetness; blackberry, blackcurrant and notes of vanilla layered on sliced apple and pear. This brings to mind memories of our time berry picking during the summer; the smell of the fresh air weaving in and out of the diverse range of berries, orchard fruits and lush green. The earthy theme continues to develop, as dry herbs and tobacco mingle with anise seed. On the palate the oak strikes solidly, bringing sharp bursts of dark chocolate and softer waves of vanilla which then magically vanish into a cloud of dry wood – PUFF! – that radiates with an array of spices (nutmeg, ginger and cinnamon, in particular) and wonderful high quality dense dry oak. The sherry shimmers in the background, never dominating, but providing a sweetness on the palate that is reminiscent of more ripened fruits; though that lovely dryness is a constant. The shades of fruit is wonderful, as the now ripened fruit take on the tartness of slowly cooked raspberry; very much like a raspberry apple crumble crisp and golden just out of the oven and oozing with lovely bright red raspberry. The finish is crisp, as dry wood lingers on the tongue and radiates with nuances of spice and the distinct earthiness that comes when biting a freshly unpacked cigar. It is not bitter, but dry and earthy as nutmeg shines on the palate in one last trick.